Miyakejima is a solitary volcanic island rising from a depth of 300 to 400m, and its active volcanic activity creates unique scenery not only on land but also in the sea. In addition, the Kuroshio is frequently docked on the island, and the sea is considered to be the northern end of the subtropical zone and the southern end of the temperate zone. Miyake's sea shows various faces such as new lava and old lava when it is not when the Kuroshio is at sea, when cold water comes from deep water, and when it is not. 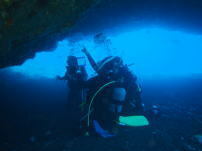 Let's dive together with the sea of Miyake and us who love living things.